Vincent Simone and Flavia Cacace and individually exceptional dancers but when the two come together to dance in Midnight Tango they create pure magic. Both have appeared on BBC television show Strictly Come Dancing and have professional careers that have made them both famous in their own right. Today they are dance partners dancing under the brand names of Vincent and Flavia. Let’s find out a little about each of them and what makes them such masters of the Tango. Born in Foggia, Puglia, Italy on March 15 1979, his parents both professional dancers, Vincent Simone has been winning dance competitions since the age of 16, with the first being the Italian Youth Championships. It was this win that caused Vincent to decide to make a career of dancing. At the age of 17 Simone moved to Guildford, Surrey, England. He has been teaching dance since his early teens, both in England and Italy, and his sister is also a dance teacher/performer. Simone and his current dance partner, Flavia Cacace met while being taught by the same dance teacher and became dance partners in the mid 90’s. Together they competed very successfully in a number of Ballroom, Latin American and Argentine Tango competitions before joining the hugely popular BBC television show Strictly Come Dancing for its fourth season. In the show Simone was partnered with a celebrity and helped them to compete against other celebrity/professional dance couples. Simone danced on the show from 2006 – 2012. For the past few years Simone (together with Cacace) have starred and co-choreographed three successful shows: Midnight Tango, Dance ’til Dawn, and The Last Tango. Simone is married to Susan Duddy and together they have two children, both boys. He and his dance partner Cacace dance professionally as well as teach dance. Born in Naples, Campania, Italy on March 13 1980, Flavia Cacace is the youngest of six children and moved to England when she was only 4 due to her father, a chef, taking up a new position. Cacace was blessed with a mother whose own ambition to become a dancer led to her and her sister taking dance lessons from a very early age, Flavia at age 5 and her sister at age 6. Although her mother didn’t know it, Cacace was taking lessons at a very good Ballroom and Latin dance studio that people would travel internationally to attend. Cacace, like her professional dance partner Vincent Simone, appeared on several seasons of the very popular BBC television show Strictly Come Dancing, beginning in the fourth season in 2006. Over the years of dancing with celebrities competing for the title Cacace has some success but it wasn’t until 2012’s tenth season, when partnered with Louis Smith, that Cacace actually managed to win the competition. Previously the closest to winning she had come was to make it to the final in 2007 when partnered with Matt Di Angelo, with whom she had a relationship for three years following the competition. Incidentally, it was in 2010 that she danced with Jimi Mistry, who she married in 2013. It was also in 2013 that Cacace and Simone announced that they would not be returning to the Strictly Come Dancing television show as they wanted to focus their efforts on choreographing and starring in their own shows. Cacace, along with her professional dance partner, Simone dances under the brand name of Vincent and Flavia and have co-choreographed and starred in three successful shows: Midnight Tango, Dance ’til Dawn, and The Last Tango. Flavia Cacace is married to Jimi Mistry and while the couple do not have any children as yet they are ‘parents’ to two dogs, a rescue mixed breed and a cockapoo. 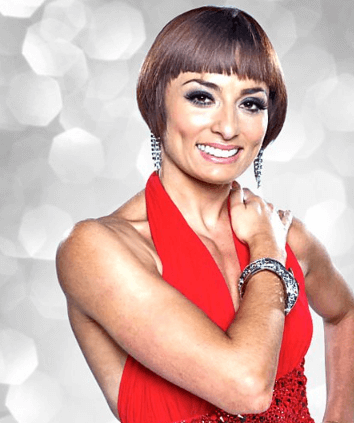 In addition, Simone (together with Flavia Cacace) has been UK Ballroom Champions for a number of years, and in 2002 to 2006 they were World and European Ten Dance and Show Dance finalists.